When we review any product, we put ourselves in our readers' shoes and proceed with a very skeptical eye. We want you to make the best possible choice and get what you need with confidence. That's why we put some extra time into reviewing this Ego battery-operated mower! To be perfectly honest, many mowers of this kind are junk. But this one impressed us enough that we are ready to recommend it to our readers who need or want a model with its unique features. If you want to do away with the noise, pollution, maintenance costs and seemingly endless upkeep of gas mowers but don't want to be tethered to your house by a power cord, you should take a good look at this electric mower. Not only does it outperform almost every other electric model we've seen, but it actually puts many high-end gas mowers to shame! After you read this, you will be acquainted with this grass munching machine and have all the information you need to decide if it will suit your lawn, your budget and your basic human desire for cool features. EGO Power+ 21 Self-Propelled Lawn Mower delivers up to 60 minutes of run-time. This powerful mower uses 7.5ah Arc Lithium battery that delivers long-lasting power, rapid charging, and durability. This lightweight mower is easy to start with a push of a button. This is a powerful self-propelled mower that gives a high-quality cut with minimal effort on your part compared to other battery-operated mowers. It has all of the features found in similar gas models and then some. In fact, it has just as much torque as a comparable gas engine. There's plenty of power to cut long, thick and even wet grass. This is a rare attribute among electric mowers. The cutting height is adjustable to any length you could want. Regardless of how much you are taking off of your lawn, the only time you might run into clipping discharge issues when you cut wet grass. The mulching deck does a great job grinding up the toughest grass. You also have side-discharge and bagging options. The three-position adjustable handle folds for compact storage. For some reason, Ego recommends that the mower be stored flat on its wheels instead of hanging on a wall. There is no oil or gas to leak out, so the choice is ultimately yours. Does your busy schedule sometimes require you to mow very early in the morning or after sunset? If so, you will love these bright LED headlights! Now let's talk about how this mower offers such a nice cut. Its motor provides every bit as much torque as a gas engine. This is enough to meet all reasonable demands that any lawn can make. The engine won't bog down and cause the blade to smash and tear your grass the way a low powered electric mower engine will. RPM refers to the speed at which the blade spins. A faster spin allows for a cleaner and healthier cut. This mower's blade RPM is a bit slower than that of a gas mower of the same cutting width, but it is still high enough that you wouldn't have noticed if I hadn't told you. This fast spin makes for a clean cut. Blade sharpness is your responsibility. No matter what kind of mower you use, you should keep the blade sharp so it will cut your grass instead of tearing at it. This mower's awesome cut quality really shines through with a sharp blade on it. You want to get your mowing done quickly, but don't go so fast that you overwork the mower. Having to cut too much fibrous grass at once is bad for the motor, dulls the blade quickly, and it can cause the blade to pull the grass up out of the ground instead of cutting it smoothly. Set the mower's forward speed slower for long or thick grass and faster for thinner and shorter grass. Don't take too much off at once either. If you cut more than a third off at once, the roots stop growing and you end up with a patchy lawn. Using this mower is a straightforward matter. First, you set the cutting height with the single adjustment lever. Then you adjust the handle to a comfortable length, if you need to. Once that's all set, you just push the power button to get the blade spinning. Set the speed you want and enjoy your yard work. But what about mowing up hills? The wheels have very good traction. You may have to push a bit to help the mower up, but the traction is good enough that you can just lift up some on the handle to put more weight on the drive wheels. That should get you up all but very steep or wet hills. You will get an hour of run time under ideal conditions. Remember I said that the removable battery pack is a big pro? That's because you can buy an extra battery so you always have a fully charged pack as a backup. This can increase your run time to up to two hours per mowing session. Swapping a pack out takes less than 10 seconds. The self-propulsion system is unremarkable when compared to other self-propelled mowers in the same price range, except that it adjusts from almost two up to three and a half miles per hour. That's a range from a slow stroll to a fast walk. There's really not much to talk about here. We do want you to know that if the motor on this mower blows, you might as well buy another mower. It is hard to find a repairman qualified to work on this type of electric motor. And if you do find someone, the repair bill would likely exceed the cost of replacement. Of course, this would be no problem if that it breaks down during the five-year warranty period. Then you will get a free repair or replacement. Routine maintenance for this mower means keeping it clean and the blade sharp. If you spray under the deck regularly, you shouldn't have to scrape a lot of petrified gunk from it. Just use a garden hose and spray clippings away after each use. It wouldn't hurt to spray some aerosol lubricant under the deck after every spray down. Give the wheel axles a good spray while your at it. Other than sharpening the blade once or twice per season, that's all the regular maintenance this mower needs. You can expect the battery to last about five years, in case you are wondering. We've talked some about the speed of the blade and torque. This mower's engine provides plenty of both. We could go into a complex explanation of these two factors and how they compare to more traditional mowers, but suffice it to say that this motor puts out about as much torque as a seven horsepower gas mower engine. This power does not drop off steadily as the battery drains. The power output remains steady until the battery is almost dead. Only then will you notice any decrease in power. The only reason you would need more engine power than this mower provides is if you are cutting six inches of grass at a time or trying to chop thick weeds. Neither of those endeavors are recommended for any residential mower. One could say that this mower itself is a special feature. We really are that impressed with it. But there is one feature that stands out here. It's those super bright LED headlights. You usually see them on riding mowers, but Ego pulled out all the stops when they designed this model. The lights are bright enough to allow you to mow in the dead of night. Who Should Buy This Mower? Someone who wants a deluxe gas mower but doesn't want to fool with a gas engine sounds like a person who is very hard to please. But guess what? Now we have a way to make that person happy! 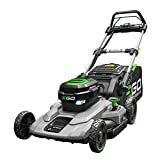 If you can get your yard mowed in about an hour with whatever you are using now and you want an environmentally friendly electric mower with some serious power, take a good look at this mower. The price is a bit high at about $540, but you get what you pay for in this case.